This is an exciting time for AASA, The School Superintendents Association. It’s also an exciting time for school system leadership and public education. In two weeks, hundreds of superintendents will convene in Phoenix, Ariz., for the National Conference on Education where AASA’s 2016 National Superintendent of the Year will be announced. I couldn’t be prouder of our finalists. 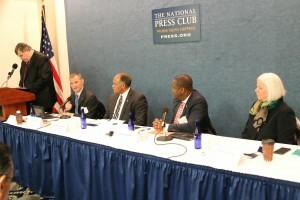 I had the opportunity to meet them during our press conference at the National Press Club in mid-January. In my view, we have four winners. I know it will be a difficult choice for our panel of judges. The 2016 Superintendent of the Year will be announced on Day 1 of our national conference, Thursday, Feb. 11. Congratulations to these outstanding individuals. I invite you to view our latest video where you’ll hear more from Superintendents Moran, Tucker, Webb and Williamson. 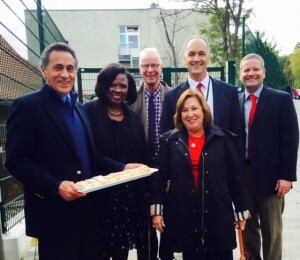 Dan Domenech with the AASA Delegation, Director Razidlo and a plate of apple strudel. Vienna, Austria – AASA’s International Seminar is concluding and our school visits and meetings with education officials have been very informative. It was after his visit to Austria that Horace Mann brought back its grade level structure, an organizational format still in use today. However, there are several practices in Austria today that we would not want to import. The country’s school day is much shorter than ours. At the primary schools (grades PreK-4), children are dismissed at lunchtime. The secondary school day lasts for about five hours. Meanwhile, Austria offers free programs for all three, four and five year olds, as well as full-day kindergarten. An idea we should definitely import. At the end of fourth grade, Austrian students are sorted into two groups—those, who continue with an academic program leading to college (about one-third of the students) and those who’ll pursue a vocational track and apprenticeships (two thirds of the students). From our perspective, this sorting occurs too early. It might be more appropriate at the end of eighth grade. However, Austria offers a free college education to all students, another great idea. Stephen Razidlo, director of the American International School in Vienna, believes that many of the Austrian students attending his school do so because their parents did not want their children subjected to that selection process. Also, the American school offers a full day of instruction from K-12. It was a great experience shared with David Schuler, AASA president; Amy Sichel, AASA past president; Bob Mills, former AASA executive board member; and Miranda Beard, president-elect of the National School Boards Association. 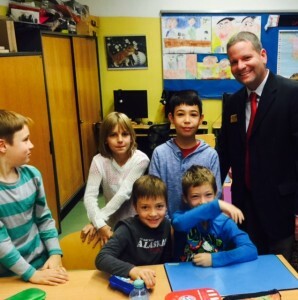 Dan Domenech, executive director of AASA, The School Superintendents Association, is blogging throughout AASA’s International Seminar Delegation in Austria. 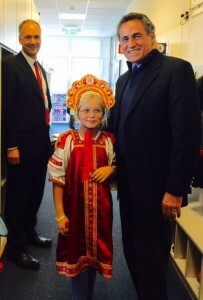 Dan Domenech with Director Stephen Razidlo and a student at the American International School of Vienna. Vienna, Austria – There is a piece of the United States in Vienna. It is the American International School there. Stephen Razidlo, former superintendent in Brainerd, Minn., is now the director of the Pre-K-12 system serving nearly 800 students. It is interesting to note that the majority of the students here are not Americans but Austrians and students from more than 40 countries seeking an American-style education. American International Schools are in essence private, tuition-charging schools that cater primarily to the children of our diplomatic core in those countries and to the children of other Americans living abroad. However, they also accept students from the host country and other foreign students living there. Our delegation was very impressed with the visit. The elementary school was celebrating United Nations Day and children were urged to come to school wearing their native garb. The photo above portrays a young lady in a Russian costume. Cultural understanding and acceptance in such a bicultural setting is essential. Director Razidlo shared that in the height of the Russian-Ukraine conflict, students from those countries attending the school continued to maintain cordial relations with each other. It was interesting to note that the school follows the Common Core curriculum, even though they are not required to do so at the elementary and middle schools, and the International Baccalaureate Diploma Program at the high school level. Tomorrow, we will review the differences between the Austrian and the American schools and why it’s popular with the parents who send their children there. High school students in Vienna prepared snacks to sell and raise money for refugees. Vienna, Austria – Austria is a small country with a big heart. Despite just having 8 million residents, the country takes in 10,000 Syrian refugees a day and everybody is pitching in to help. 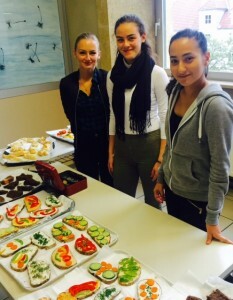 Students at one of the schools we visited prepared snacks to sell in school to raise money for the refugees. Universities are free in Austria. Students we spoke to are in the academic or “gymnasium” track and are expected to go to college. That decision was made when they were 10 years old at the end of primary school. Students not selected for the academic track go on to vocational programs and learn a trade. Two-thirds of Austrian students are in the vocational track. Such a system would never fly in the U.S. Austrian education reformers rightfully consider such an important decision at such a young age to be inappropriate. Although some Austrians suggest that students always have opportunities to get into the academic track, the majority of those we spoke to admitted that it rarely happens. On the plus side, vocational programs provide participants with opportunities to learn a trade. These programs offer wonderful apprenticeships resulting in gainful employment and a low unemployment rate for Austria. 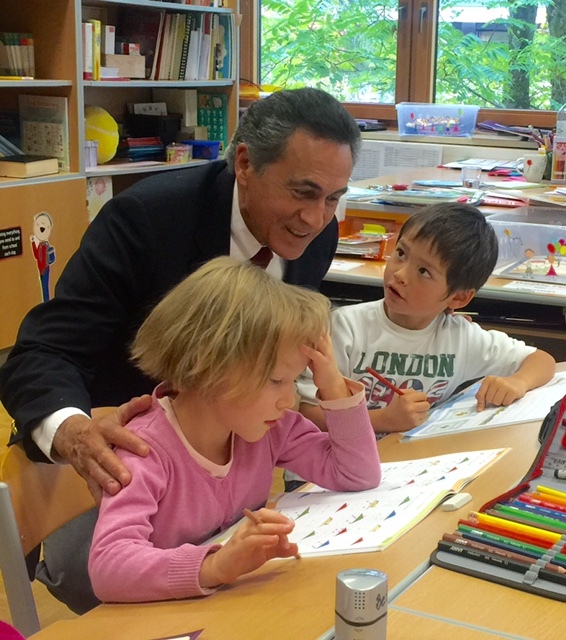 AASA Executive Director Dan Domenech with students in the International Class at the Pedagogic College of Salzburg, Austria. Salzburg, Austria—There is a lab school at the Pedagogic College of Salzburg that serves students in grades 1-4, which is a typical Austrian Primary school. Professor Deborah Pelzmann, the principal of the school, is charged with developing innovative practices in education and introducing students at the Pedagogic College to those practices. I was delighted to discover that personalized learning is the prevailing practice for the schools. Professor Pelzmann is proud that students at the school take responsibility for their own learning, and are always taught at the level that is appropriate for them. Teachers seldom “lecture” their classes. Every week, students fill out their schedules detailing which subject they will take, what time they will take it and for how long. At any given time you can find a mixture of students from all four grades working on the same activity, provided that it is suitable for their ability level at that time. Student teachers at the College spend time in the lab school classroom beginning in their very first semester Professor Pelzmann is hoping to train a new generation of teachers for whom the personalized learning approach will be the only way to teach. 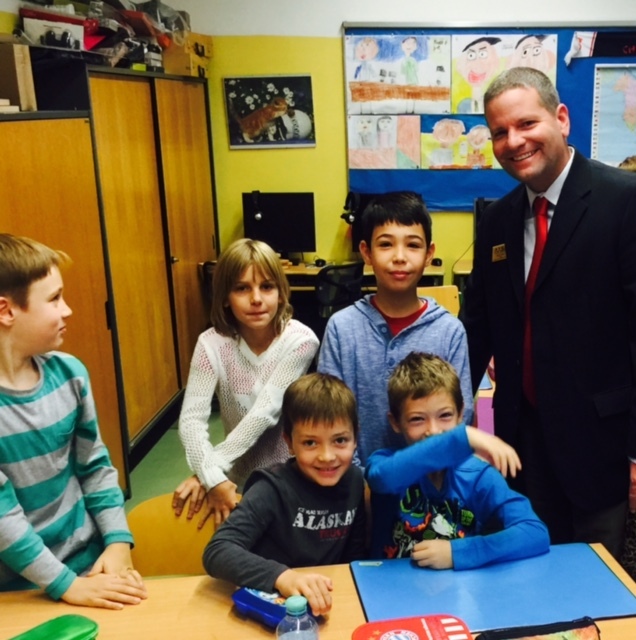 St. Polten, Austria – As a former building administrator and now with AASA, there are certain signs I look for when I first walk into a classroom to tell me if I am in the presence of a good teacher. In Senta Seidel’s third grade class, I saw students physically clinging to her as if they were afraid she might leave them. I asked a young lady why they were clinging to their teacher. She answered, “Because we love her.” Ms. Seidel made it clear—she loves her students in return. Primary schools in Austria are grades 1-4. Ending at lunch time, it is a relatively short day for students, but child care is offered after school. Students also have the option to avail themselves for extra assistance from their teachers should they need it. Austria, like many other European countries, is being inundated by Syrian refugees. As many as 10,000 refugees are coming into Austria every day. Many of the refugee children are finding their ways to school doors and are asking for admission. Unfortunately, schools are not receiving any additional governmental support to deal with the crisis. Consequently the school head mistress turns to the staff and asks them to do whatever they can for the children, and they do. That is why teachers like Ms. Seidel are loved. It is heartwarming to see that, regardless of the country we visit on these international seminars, teachers and principals are always there to go the extra mile for their students.